Day 2 - We did a Rum Point drift snorkel this day. This was the best snorkel day we had the entire time on the island. Take your time and plan to spend about an hour and half to two hours doing this drift. There is so much to see! This reef area is very healthy and vibrant! 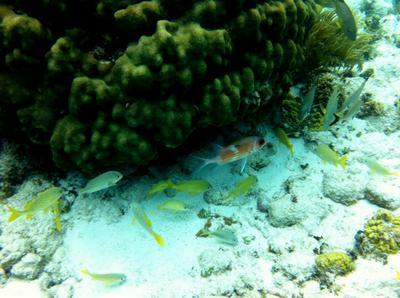 We saw tons of beautiful fish, corals and soft corals and a stingray just as we were coming in at Rum Point. I am certain it is one of the rays we saw the next morning at Stingray City, as it is just off Rum Point. I found that when I saw a coral boulder with any fish at all, I would stop and hang quietly over it and just watch what was going on. After just a few moments of being quiet, the fish will come back out and resume what they were doing and put on a wonderful show for you to watch! Then, quietly circle the boulder, because you will see different things on the other side of it, and it is too good to miss! 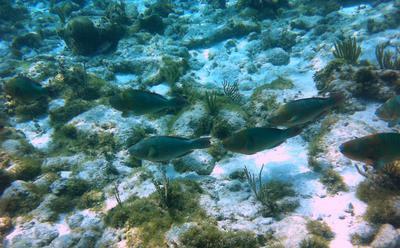 We saw many different types of fish, from Squirrelfish to Spanish Grunt to Parrotfish and Wrasse along with others. Once you reach the point, where you can see the pier, simply swim in on this side of the pier and walk out of the water on the white sand beach. You may want to tuck a few bucks into a waterproof pouch to grab a meal or snack at the eatery there on the beach. From there you can walk back to your car down the road, or, you may have possibly parked at Rum Point and walked down the road to get in the water at Cayman Kai Beach. In any case, do not miss this amazing snorkel experience! We did have our flip flops with us attached to a string and carabiner. Oh, the nice thing about snorkeling Grand Cayman is that there is virtually no boat traffic in the inside areas that are great for snorkeling, with one or two exceptions near resorts where there are Wave Runners, and those are marked by buoys that they are required to stay beyond. I had been doing research on snorkeling sites for Grand Cayman and found “Testudo’s Grand Cayman Snorkel Guide”. 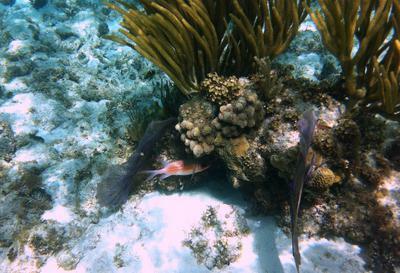 This truly is the best snorkel guide you will find out there for Grand Cayman. All of the sites he gives information on are located on the northern side of the eastern portion of the island, and we found this to be the best snorkeling area on the island. I highly recommend that you go to his site to guide you. Odd that we were there in the same area about a month before in 2013. I snorkeled off the pier on Rum Point and headed north past the grass bottom and found an area that probably was at the end of your "drift" snorkel. It was pretty cool but after a few minutes out there the Rum Point "security" flagged me to come in because I was without a flag (for fear of boats or jet skis hitting me). I would agree that your experience is well worth the effort but just be sure you have some form of "flag" so you are seen by boaters. 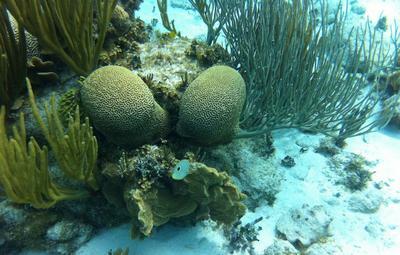 By the way, there are also lobster, under the grass coral where indented, and large crabs inside the some of the coral "boulders". Eels out there too.